Wilkinson, Bruce W.. "International Trade". The Canadian Encyclopedia, 20 February 2018, Historica Canada. https://www.thecanadianencyclopedia.ca/en/article/international-trade. Accessed 26 April 2019. Since 1960 (except 1974) Canada has exported more commodities than it has imported and has had a merchandise trade surplus. ​International trade is the purchase and sale of goods or services between residents of different countries. The traders may be individuals, private businesses or government agencies. Canadian exports of merchandise and services amount to over 40% of the nation's total production, the merchandise accounting for about 33.5% while services and investment receipts make up the balance. Since 1960 (except 1974) Canada has exported more commodities than it has imported and has had a merchandise trade surplus. Services and payments for borrowed capital have normally greatly exceeded the export of services and receipts from investments, so that there has generally been a sizable annual deficit in combined trade in commodities and services. For the years 1988-1994 inclusive this deficit averaged $25 billions annually - which is the amount Canada had to borrow abroad to make up the difference. In 1995 and 1996, however, because of particularly strong growth in Canada's merchandise exports, this deficit has been reduced dramatically so that for 1996 it was only $1.7 billion. The US, which purchases about 82% of Canadian merchandise exports (and which supplies nearly 76% of all merchandise imports), is Canada's most important trading partner. Reliance upon the US as a market for Canadian products has been growing for 100 years. Until WWII the US and the UK frequently exchanged positions as the first and second most important destinations for Canadian exports. However, the UK now imports only 1.5% of all Canadian shipments abroad and only 2.6% of Canadian imports now comes from the UK. 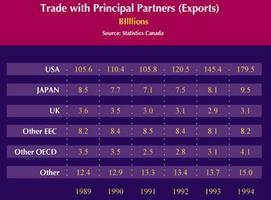 Japan has supplanted the UK as Canada's second most important trading partner, although it is not nearly as important as the US, accounting for only 4% of exports and 3% of imports. Almost all imports from Japan are highly manufactured commodities, such as automobiles and electronic equipment, whereas exports to Japan are almost entirely raw and semiprocessed materials, such as lumber, metals, coal and farm products. The relative significance of Canada's trade with the European Union (EU) countries (including the UK) has fallen since the mid-l960s, and now accounts for only 5.7% of total exports and 8.7% of total purchases abroad. Although still small in relative terms, trade with the nations of Southeast Asia is of increasing importance. Exports of wood and paper products, cereal grains, machinery and equipment, metal products and chemicals, and imports of electrical products and machinery of various types are all becoming increasingly important as these nations industrialize. China, which now is the source of over 2% of Canadian imports, could soon surpass Japan as a Canadian source of supply. About 46% of Canadian exports are automobiles, machinery and equipment and various consumer goods. Products based on Canada's natural resource industries - agriculture, energy, fishing, forestry and mining - make up the remaining 54%. In contrast, about 66% of Canadian imports are in the first three categories, while only 31% are natural resource-based products. Consequently, Canada continues to have a surplus on commodity trade in natural resource-based products and a deficit on other manufactured goods, a pattern throughout Canadian history. In its early development, Canada depended almost exclusively upon its natural resources for its export base, relying first on fish, furs and lumber; then on farm products, especially grains, pulp and paper, and various metals and minerals. Since WWII petroleum and natural gas, fertilizers and petrochemicals, uranium, iron ore, sulphur, potash, coal, electricity, canola and red meats have augmented the nation's resource-based exports. Diamonds promise to be another significant export in the years ahead. Today, relatively few products dominate the export trade in each broad category. Wheat accounts for 24% of all agricultural exports, while live animals and meat products account for another 20%. Softwood lumber, wood pulp and newsprint comprise about 77% of forest-product foreign sales. Iron, copper, nickel and zinc ores and concentrates total 71% of crude metal exports, whereas refined forms of these, plus aluminum and precious metals, account for nearly all metal and alloy exports. Automobiles and parts alone make up 23% of total exports. On average, highly manufactured goods, including office machinery and equipment (such as computers), chemicals and fertilizers, and miscellaneous manufactured goods, are, in volume and value, the most rapidly growing segment of Canada's exports. They are also among the fastest-growing imports, so that the absolute dollar deficit for Canada in such products for 1996 was still $25 billion. Other fairly rapidly growing traded products include petroleum and natural gas and industrial materials. 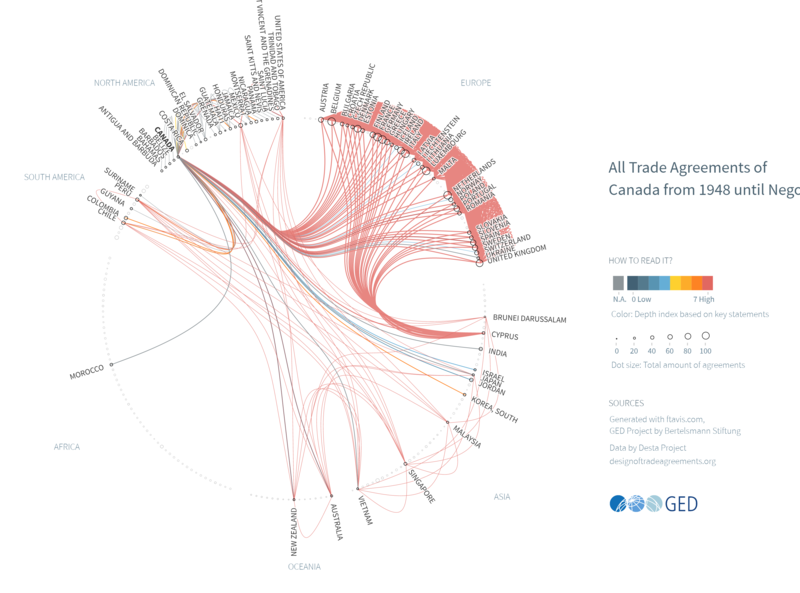 Canada's particular mix of merchandise trade can be attributed to a variety of factors. First is the nation's endowments of both renewable and nonrenewable natural resources. They provide the foundation for comparative advantage in, and the massive shipments abroad of, crude and semiprocessed minerals as well as energy, agricultural, forestry and fishing products. Even highly processed exports from the chemical sector rely on natural gas and petroleum deposits. The Canada-US Free Trade Agreement and, subsequent to it, the North-American Free Trade Agreement have been important in stimulating greater north-south trade. On the one hand, Canadian manufacturing firms have had their protection removed, thereby forcing them to reorganize, adopt the latest technology and generally become more efficient. On the other hand, the removal of the remaining US tariffs and the focus on globalization generally have prompted Canadian firms to become much more export-oriented. These forces have been augmented by the growth and prosperity of the US economy, which has drawn in more products from Canada to meet its needs. In addition, research and development in a few outstanding sectors such as telecommunications, and Canadian production by firms under licence from foreign parents or holders of technology, have been significant in expanding exports. More aggressive and better-educated management, improved labour-management relations, and the control of inflation have all contributed to Canada's strong export performance. Generally, however, Canadian research and development in the manufacturing sector has not been as strong as it might have been. This fact, coupled with the rapid pace of technological advance in other developed nations, has meant that Canada has had to rely heavily on imports of technology-intensive products to meet its needs. Hence the large proportion of highly processed manufactures imported. This proportion is also related to the high percentage of FOREIGN INVESTMENT and control of Canadian manufacturing, because foreign-owned firms import a larger share of their purchases than domestic firms do. In many cases these firms import components and parts and simply assemble them in Canada. Imports of many consumer products such as clothing, shoes and toys are also large because they are labour intensive, and many of the developing and newly industrialized nations of Asia and Latin America have much lower labour costs than does Canada. Canada's terms of trade, that is the price of exports relative to the price of imports, have improved slightly since the mid-1980s - by about 4% - because of strengthened prices for resource-based products such as wheat, lumber and paper products, and metal products. The other noteworthy change has been the large drop in the price of computers and other office equipment. But this drop has not influenced the terms of trade a great deal because Canada both imports and exports such products. Trade has also been affected by Canada's commercial policy, especially import tariffs - which are decreasingly important because of reductions as a result of both the Canada-US Free Trade Agreement and the Uruguay Round of GATT negotiations. Tariffs are taxes or duties levied, usually as a percentage of declared value, on imported merchandise. Canada has also used import quotas which are specific quantitative restrictions on imports of particular commodities. In 1986 Canada concluded the Caribbean Agreement with the Commonwealth countries and territories of the Caribbean, thereby permitting tariff-free entry for all products from those lands with the exception of several product lines such as clothing, textiles, footwear and leather goods. Canada also is a party to the Generalized System of Preferences which normally gives one-third off the Most Favoured Nation rate or tariff-free access to products from virtually all developing nations in the world. For those developing countries considered as newly industrialized countries, Canada has, however, withdrawn the Generalized Preferential Tariff on a wide range of products. Canadian tariffs are now at their lowest level, and will be reduced even more as the Uruguay Round of reductions is completed. 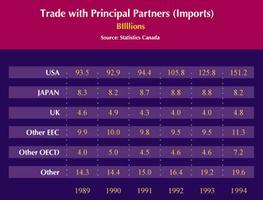 For 1996, they amounted to 1.32% on average for all imports and 6.06% on dutiable imports. Nondutiable imports accounted for 78.15% of all purchases from abroad. Various bilateral and trilateral agreements before WWII, eight postwar multilateral negotiations under the General Agreement on Tariffs and Trade (GATT), as well as the Canada-US and North American Free Trade Agreements have reduced enormously the Great Depression tariff rates. The completed Uruguay Round of multilateral negotiations, which came into effect on 1 January 1995, resulted in further reductions on a wide range of goods. The 1996 free trade agreements with Chile and Israel, which came into effect in 1997, will not have much impact on average Canadian tariffs (or on total Canadian trade flows) because imports from each of these nations are only about 1/7th of 1% of total Canadian imports. More significant reductions will come about if the continuing discussions with the nations of the entire Pacific Basin under the auspices of APEC produce the free-trade results that the members are hoping to achieve early in the next century. In the past, under tariff protection, more domestic and foreign-owned manufacturing plants were established in Canada than were needed to supply the market efficiently. Often the plants were either too small to achieve the lowest production costs or, more often, produced too many product lines so that lengths of runs were shorter and more costly than in foreign plants. As tariffs have been lowered, firms have had to increase their productivity and become more competitive with those in foreign countries. For this reason and because of technological changes, economies of scale are a much less important determinant of comparative advantage than they once were. Quotas are quantitative restrictions on imported merchandise. Under the GATT Multi-Fibre Arrangement, which came into effect on 1 January 1974, Canada negotiated bilateral agreements with about 25 countries, limiting imports of textiles and clothing. The Uruguay Round, which established the new World Trade Organization (WTO), provides that these quantitative restrictions be phased out by the year 2005 and that all the products involved come under the regular GATT-WTO rules. Agricultural products, including eggs, chickens, turkeys, milk and other dairy products, had faced quantitative import restraints, but these were removed as a result of the Uruguay Round negotiations and replaced with tariffs providing essentially the same level of protection - a process called tariffication. These tariffs are being reduced by 36% on average over a 6-year period that began on 1 January 1995. Canada purchases a range of services abroad. The most important items are travel and tourism; transportation services; and commercial services such as the charges that foreign parent firms make to their subsidiaries in Canada for management advice and technology, plus arm's-length payments for royalties, patents, film rentals and some financial services. Governments also make foreign payments for diplomatic, military and trade purposes. At the same time, Canada receives revenues from foreign residents for similar types of services provided to them. Consistently, total payments to nonresidents greatly exceed receipts from them. When Canada borrows funds, either by issuing bonds or other types of debt, or by welcoming foreign firms establishing subsidiaries in Canada, payment must be made for the use of the capital involved. This may take the form of interest, dividends or corporate undistributed earnings which are reinvested to increase the foreign ownership of Canadian industry. Similarly, Canada receives payments from foreigners for the use of the capital its residents invest abroad. Canada has borrowed much more than it has lent abroad, however, and in 1996 had a net international indebtedness of about $356 billion, and an annual deficit in services charges on this debt of over $28 billion, nearly all of which is attributable to net interest charges on Canadian bonds of various maturities. See also EXPORTS; FREE TRADE; IMPORTS. DEPARTMENT OF FOREIGN AFFAIRSAn extensive information source about Canadian foreign policy, international trade, emergency travel assistance, living and working in Canada, passports, and more. A Government of Canada website. CANADIAN FOUNDATION FOR THE AMERICASThe Canadian Foundation for the Americas is an independent policy institute, based in Ottawa, that fosters informed analysis and debate on social, political and economic issues facing the Americas.